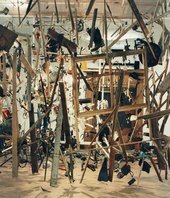 Cold Dark Matter: An Exploded View is the restored contents of a garden shed exploded by the British Army at the request of the artist Cornelia Parker. The surviving pieces have been used by Parker to create an installation suspended from the ceiling as if held mid-explosion. Lit by a single lightbulb the fragments cast dramatic shadows on the gallery’s walls. Somehow the idea and imminence of the ‘explosion’ in society seemed such an iconic thing. You were being constantly bombarded with its imagery, from the violence of the comic strip, through action films, in documentaries about Super Novas and the Big Bang, and least of all on the news in never ending reports of war. Parker liked the idea of something that happened in a split second but that could also be made to have a durational aspect to it. As an MA student she had made a series of ‘wooden explosions’ – small models of explosions, which she then left outside to weather and disintegrate. The explosion to Parker was the latest in her series of orchestrated ‘clichéd cartoon deaths’. She had previously steam-rollered silver objects and had coins run over by a train. Where you store things you cannot quite throw away. Like the attic, it’s a place where toys, tools, outgrown clothes and records tend to congregate. The mundanity and also refuge-like quality of the shed is important to the meaning of the work. By blowing it up, she is taking away the safe place, the place of secrets and fantasy, the place where a personal history of objects no longer in use – but not quite finished with – is stored. But she is also, in the process of creating an ‘exploded view’, perhaps creating a new space. The shed used in Cold Dark Matter was a composite, constructed with wood from various old shade by a company in Suffolk. Parker told them what she wanted: an 8’ x 12’ (2.44m x 3.66m) shed with windows. I wanted it to be an archetypal shed because originally I was looking for a shed any old shed – I was going around all these allotments looking at sheds and they were all too romantic in a way …you know, if you blew up somebody’s specific shed it became too biographical, so I thought I’d get this kind of constructed shed. The objects that make up the installation Cold Dark Matter: An Exploded View, range from tools to childrens’ toys. Although some are Cornelia Parker’s own, and some have a personal significance (among the books is one called An Artist’s Dilemma), most of the objects were gathered over a three month period – from friends or from car boot sales. Parker contacted the army to see if they would be prepared to help her, and to her surprise they were very co-operative. She was invited to the Army School of Ammunition where they demonstrated various types of explosives, and what these explosives could do, by blowing up a range of objects including a table and a car. She decided on plastic explosives as providing ‘the archetypal explosion’ where things just get blown up without pyrotechnics or special effects. Major Doug Hewitt was the senior instructor at the training school at the time. He met Cornelia Parker and her team on a sunny afternoon on the terrace of the officers’ mess and she put her idea to him. After the explosion the bits of shed and dispersed objects, twisted and blackened from the force of the explosives were carefully gathered together. Some objects were never found – either blown far away and missed or totally destroyed. How was the artwork made? Installing this work recreates the moment of explosion. The broken wooden fragments of the shed and the charred remains of the objects that were in the shed are suspended as if in mid-flight from the epicentre of the explosion. As the objects were suspended one by one, they began to lose their aura of death and appeared reanimated, in limbo. The light on inside the installation created huge shadows on the wall, so the shed look like it was re-exploding or perhaps coming back together again. I operate very often in these ‘frozen moments’ where there’s been lots of action but this a sort of quiet corner of that…So it’s not the explosion, it’s more the contemplation, you know, the quiet contemplation of these things in the air and because the things are in the air, they haven’t got the pathos they would have had if they were on the ground. It takes away that kind of pathos, which is there when you see a lot of the debris on the ground after an explosion, well put it back in the air and it’s still got some life. The objects gathered after the explosion are buckled and charred. Cornelia Parker describes seeing them laid out on the gallery floor as looking like a morgue. Although powerful in their destroyed and useless familiarity, they are for her, ‘too much about death’. However, once suspended and raised in the air, they are transformed. They are re-energised and rather than provoking horror, they can be contemplated. Cold Dark Matter is a three-dimensional artwork but works against some traditional ideas of sculpture. Whereas traditional sculpture is concerned with something solid, here the artist is fascinated by fragmentation and materials in a state of flux. The artist herself writes, ‘I’ve never made a solid sculpture; I am more interested in the space with and around the mass, in atmosphere’. The exploded shed and its contents are suspended using transparent wire and are lit by a single light bulb at the centre of the installation. We can walk round and look through the work, discovering it element by element. The space between objects is an important part of the work and boundaries between the work and the viewer are blurred. The objects cast dramatic shadows on the gallery walls, adding another dimension to the piece and another level of meaning. Use the slideshow above to take a closer look at a selection of the exploded objects. Can you recognise what these objects (or bits of objects) are? 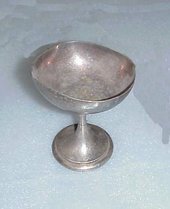 Are they everyday objects or special objects? Look at the installation again (use the photograph at the top of this page). Are the objects arranged in any particular order? Why do you think the objects have been suspended in mid-air (the artist could have laid them on the floor or placed them in a glass case)? Where do you think the light source is? If it were lit differently, how would the work change? These objects have been selected by the artist and then subjected to a violent event. What has happened to the objects? How has the process changed them? The role of the title in the work of Cornelia Parker is particularly important as it increases the number of associations in the mind of the viewer. The artist comments, ‘cold dark matter is the material within the universe that we cannot see and we cannot quantify. We know it exists but we can’t measure it. It’s immeasurable, unfathomable’. The title of the work leads us to make connections between the work and the world of science and space. As a result the subject of the world becomes an unusual collision between the small scale and everyday (the garden shed filled with familiar objects) and the vast scale of cosmic events. Cold Dark Matter can be seen as a domestic scale Big Bang. The work is also about violence: the violence that exists around us in the world but also violence as part of the creative process. Her use of a garden shed, which she considers a typical feature of British life, as a container for her objects, shows a fascination with social institutions. Other works by the artist have focussed on schoolhouses, churches and the institution of marriage. Her desire seems to be to dismantle these structures and then remake them, revealing hidden aspects of institutions in the process. If this were an exhibit in a science museum (not an artwork in a gallery) what would its title be? What point are we at in the story? What happened immediately before this moment? What will happen next? Why did the artist choose a garden shed? What objects did she choose to fill the shed and why? Parker works with objects and structures that she considers typically reflect aspects of British life. Are there any objects, things or places that you feel more typically reflect your life? Our response will always be informed by our background, culture and personal experiences and will therefore change from person to person. What are your first reactions to the work? Why do you think or feel this way? What kind of world do the objects belong to? Can you make a link between this work and your experiences of the world? Make a collection of small objects that are a microcosm of a particular world – your school, the contents of your school bag or locker. Arrange and label them as if they were an exhibit in a museum. 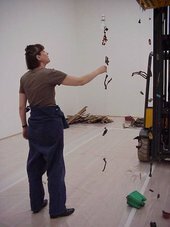 Cornelia Parker is fascinated by processes which change the dimensions of objects, flattening and stretching materials to test their limits. In one case she transformed two wedding rings, stretching it until it became a thin wire 40 feet long. The simplest process of transformation can be cutting. Challenge your friends or classmates to see who can alter the dimensions of a simple object (e.g. a paper or plastic cup) most effectively to make one long strip of card or plastic. 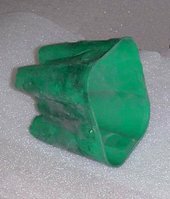 How might you change the dimensions of other, more complex objects? Cornelia Parker has referred to the ‘cartoon violence’ of her work where objects are destroyed but then spring back to life in another form. Draw a storyboard mapping out a similar transformation using an object of your choice (this could also be a photographic/digital project).